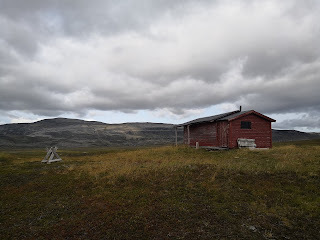 There were no more official DNT huts along this last stretch but this private shelter belonging to a local Sami. The hut book read like a who is who of long distance hiking! Rainer, Knut whom I had met on this trip and various other well known E1 or Norge pa langs hikers had written into it. I was here just for a short break in order to get out of the infernal wind ... The rest of the day consisted mainly of walking along endless reindeer fences in a truly spectacular landscape. Because the weather forecast predicted even stronger winds at night I was shooting for another private (and very tiny) Sami shelter. But when I arrived there late in the evening, it was already taken by a German hiker. 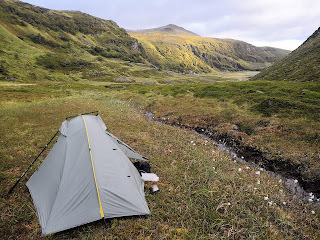 Grumpily I hiked on and found a surprisingly sweet sheltered spot two kilometres further on where I slept like a baby. The German hiker whom I met again some days later had had a problems at night because the wind had been battering his wooden shelter relentlessly - and very loud! Again I had spent a much more comfortable night in my tent than expected. But I had to get up very early for my next endeavour in the North Cape tunnel: Many people were afraid of it and took the bus through it or hitchhiked. To avoid the traffic I decided to go through it very early in the morning - and I must admit that I was a bit nervous. The tunnel is almost seven kilometres long and connects the mainland with the island of Magoyra. It goes down to over 200 metres below sea level and is definitely not for the claustrophic. 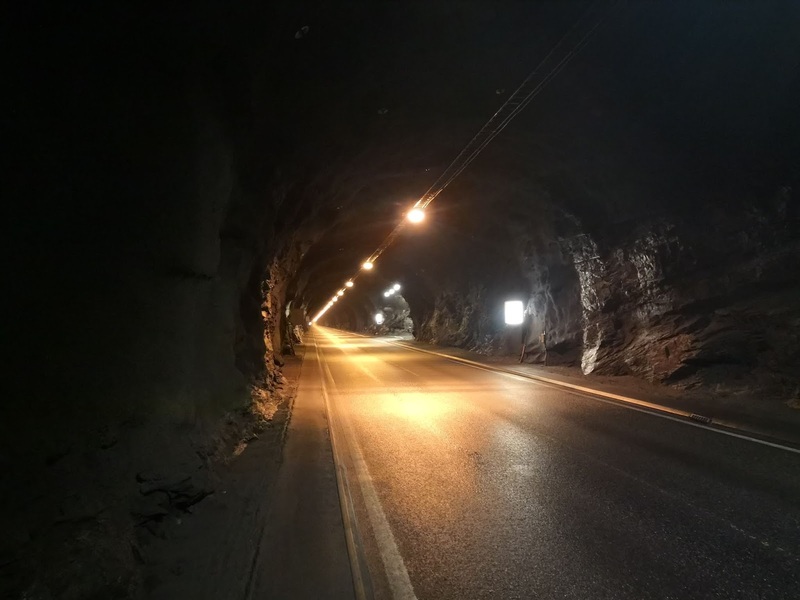 But all my fears vanished in the air when I saw a wide pedestrian walk on each side of the tunnel that was even lit very well. It took me 1,5 hours to hike through it and I felt safe the entire time. Plus there was very little traffic at six o'clock in the morning. The only frightening aspect was the noise of the cars. 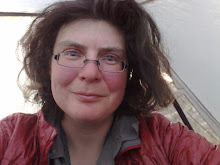 Elsewise I would have considered camping in the tunnel - sheltered from rain and wind ... I was almost sad to leave the tunnel because outside the wind was so strong that I had problems putting on my rainjacket! 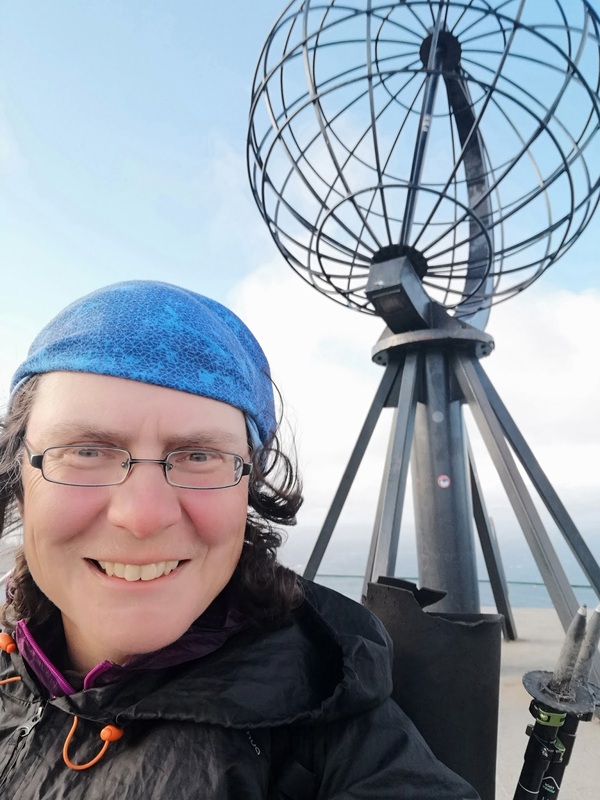 After another long road walk I was finally approaching the famous North Cape and the end of my hike! But unfortunately the wind had even gotten worse. 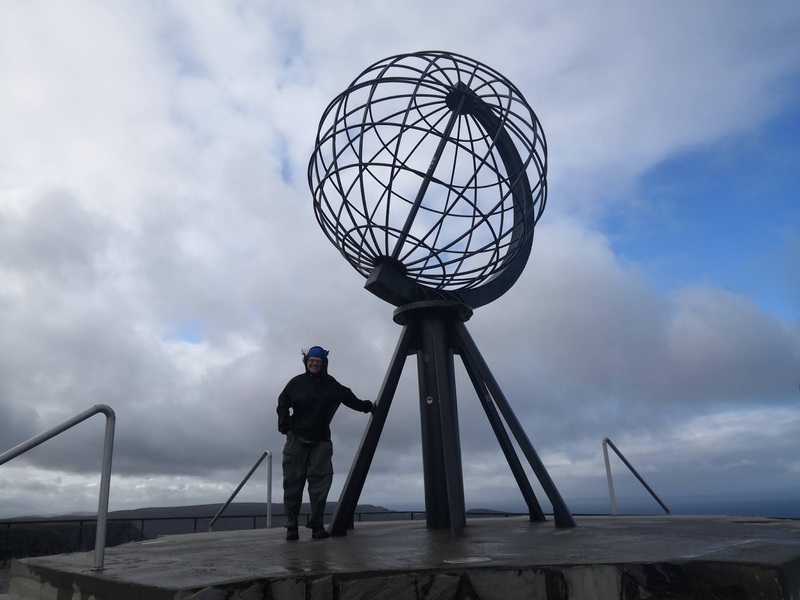 No one was out on the platform under the famous globe when I arrived at the huge North Cape Complex. At least as a pedestrian I did not have to pay the entrance fee. To my big surprise a couple of cyclists were hanging out there and I wondered how they had managed to get here in the wind when even I as a hiker had been struggling. It turned out they were on e-bikes and of course they were Germans, too! I quickly recruited them to take my finish picture. When I later tried to take a selfie I could hardly hold the smartphone steady in the wind. The buff on my head was blown away and I rescued it in the very last minute from disappearing in the sea! People always ask me how I feel at the end of such a long hike. Honestly, I don't feel very sad or happy or elated or depressed. My goal in hiking is the route and not reaching the end of a trail. What I felt was relief. Relief to have reached the North Cape without any weather catastrophy or other major problem. The day before Dagmar who had hosted me a couple of weeks earlier had sent me a text message: "My Sami colleague has told me that the reindeer are becoming more and more nervous now. Therefore Sami people think that the weather will turn very soon and winter will set in quickly. Hurry up!" The next day I had reached the North Cape - probably just in time. From now on I could read the weather forecast without having to worry. What a relief! At the North CapeI had not only reached the end of my Northern European traverse but I had also completed my big European hiking project. I have now traversed Europe both from East to West and from South to North, a total of 15,700 kilometres through 16 countries. To my best knowledge I am the first person ever to have hiked across Europe in both directions. That makes me proud - and thinking of the next big project!